I fell more and more in love with this book with each chapter. Which means, 1) it took awhile to get there but 2) when it got there, the journey felt SO worth it. 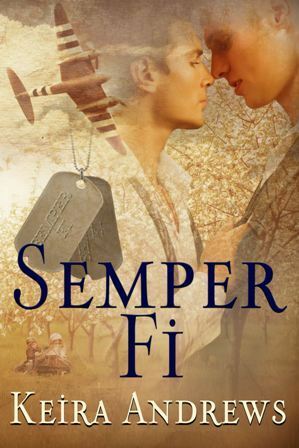 Semper Fi is full of da tropes…friends-to-lovers, military/wartime, gay-for-you (hints of out-for-you), widowed man w/ children finds love with a man, historical (battling not only the legal but societal views against homosexuality), rich-man-poor-man…but it didn’t feel overdone and “kitchen sink”-like. All of these had a place and actually contributed to the powerful story. Told in alternating flashbacks vs present-day chapters, the story tells of the deep friendship developed between two young marines, Cal & Jim and the their lives both in the military and after the war. It is a slooooow build. But their friendship and loyalty to one another is touching and when the attraction is revealed, an entirely new set of joys and pains is introduced. There are loads of ups and downs that these guys face apart and together, but that’s what made it all feel…like a treat by the end. I will admit that in the beginning, I was feeling impatient. And though I really liked reading about their friendship both in basic training and throughout the war, I wanted something to actually HAPPEN. And even while reading the following chapters in present-day time, again, I was anxious for their big “OMG, I SO LOVE YOU!” moment! My own impatience made me think that I might not have been enjoying the book. But, I kept reading…and I did so leisurely. And as I progressed, this shift happened…I was invested. I’d spent too many days with these guys already not to see it through. I had to not only see them get there, I had to know HOW they did…I found myself, surprisingly, totally enchanted with the journey. And the icing on top was when they discovered their love. But, the book…well, simply is lovely. It’s sweet. It’s brutal (the nightmarish war scenes). It’s heartbreaking (having to hide your love). It’s triumphant (love conquers all). And it worked for me. Beautifully written and a powerful story. HIghly recommended. ACK! I can’t wait for this one to be out. Great review. Another added to my list, at least with an 11th November release date, I can catch up with some others first. This entry was posted on October 29, 2014 by BioB in Cops / Cowboys / Military, Historical, Reviewer: Susan and tagged 4 Stars, friends to lovers, keira andrews, self-pub.